Okay, so I’ve been admonished. Friends and readers who say they just want to buy a modest bottle of wine and not have to endure wade through my ramblings about posh wines have spoken their minds. “Write about wine I can actually afford,” people have said. And I will, but not before I say something important about wine that just happens to involve bottles costing a lot of money. Here goes: I’d say it’s safe very few of us actually get to drink wine of any significant age. Wine we see in specialist shops – and particularly supermarkets – tends to be released at a relatively young age for early drinking. That is a fact. It is widely known that most bottles sold are opened on the same day they are bought; only true wine nerds care to mess about with any of that cellaring faff (people like me, I suppose). Most of the world lives bottle to bottle. Add to this the fact producers sell a lot of wine young because they need the revenue and you have a society full of wine drinkers who have never tried something truly mature. This is a shame. And I will tell you why. Even if Paul Masson wasn’t the sort of wine you would brag about drinking, the message was at least right. A couple weeks ago this mantra was reinforced in my mind when I attended a wine tasting of the 2003 and 2004 vintages of Bordeaux estates Chateau Calon-Segur and Chateau Phelan-Segur at an event hosted by Schroders for personal finance journalists (full disclosure: Schroders organised and paid for the wines). First, we started the night with Joh. Jos. 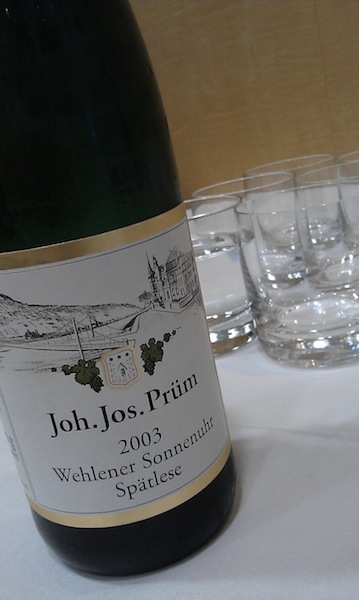 Prüm’s Wehlener Sonnenuhr Riesling Spätlese 2003, which itself was an education in drinking medium-term aged riesling. The aroma of gasoline/petroleum was almost off-putting at first, hitting your olfactory centre with a pungent rush that might have turned off shy wine drinkers. This was a far cry from your father’s bottle of Black Tower. After this, we sat down for the main event, where we compared the 2003/04 Calon-Segur with the 2003/04 Phelan-Segur. The Calon-Segur, known for being the bigger, better and more expensive of the two, was still tight and closed at nearly a decade old. Meanwhile, the 2003 Phelan was starting to show its age a little more and, arguably, was more mature and closer to being ready for drinking. A few days later the Segur’s youth was driven home when I drank something truly mature – a bottle of Chateau Lafite-Rothschild 1978. I can’t really help myself but transform into Miles from Sideways and bore you to tears with the way the wine was showing its age by bricking at the edge, how the tannins were full integrated into the wine, or how it had aromas of leather, cedar and tobacco. But I will say the exercise illustrated just how much potential the wine would have had if it had been, well, not opened so soon. This point was re-affirmed the day after the Lafite experience when, armed with a bottle of Calon-Segur 2004 that had been opened but not used at the tasting earlier in the week (I pushed the cork back into the bottle, to keep it perfectly fresh for a few more days), I opened again it for a friend at dinner. And it was…still tighter than a rusted nut and loaded with tannin. If all this wasn’t enough, yet more mature wine came my way. 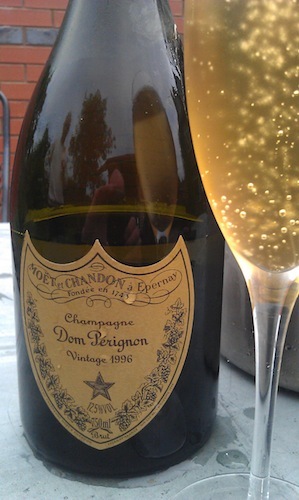 The following evening we cracked open a bottle of Dom Perignon 1996. You know how a lot of Champagne is very acidic, bright, bubbly and seems to cut through everything you might have eaten, including your gums? You see, you don’t get that with properly mature Champagne. Everything just…sings in harmony. So here it is. If you want something with more maturity and a decent dose of bottle age, Rioja is a good bet. I am always blown away by how cheap and well-made the wines of Rioja are. Something like a gran reserva will have spent a lot of time in barrel and yet more in bottle before being released, quite often for a fraction of what you’ll pay for equally fine wines from Bordeaux or Burgundy. Same with Port, Madeira and Sherry. If you want to drink something grown up and complex, I’d look south to the Iberian peninsula. Recently I bought a bottle of Rioja from the 1996 vintage for less than £15. In general, unloved wine regions can be a source of wonderful wine bargains. 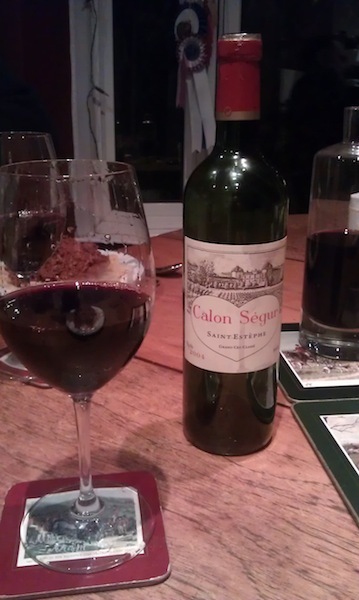 I bought a bottle of Chateau Calon Montagne-St Emilion 1996 for €8 when I was in Bordeaux. Why was it so cheap? Because the Montagne-St Emilion appellation is a lesser cousin to St Emilion and, therefore, is not as popular among wine drinkers. And there you go; something affordable to consider.